is an imperial palace of Japan, though the Emperor of Japan is not in residence. The Emperor has resided at the Tokyo Imperial Palace since 1869 (Meiji Restoration) and ordered the preservation of the Kyōto Imperial Palace in 1877. The Kyōto Imperial Palace is the latest of the imperial palaces built at or near its site in the north-eastern part of the old capital on Heiankyō after the abandonment of the larger original Heian Palace (大内裏, daidairi) that was located to the west of the current palace during the Heian Period. The Palace lost much of its function at the time of the Meiji Restoration, when the capital functions were moved to Tōkyō in 1869. However, the Taishō and Showa Emperors still had their coronation ceremonies at Kyōto Gosho.
. Shishinden 紫宸殿 Hall for State Ceremonies . and a number of residences for the Empress, high-ranking aristocrats and government officials. The gardens associated with the Imperial Palace in Kyoto may date no earlier than the rebuilding of the palace in the middle of the 19th Century. They are of some interest to the historian of Japanese gardens, however, in that they contain elements that appear to be conscious revivals of Japan's earliest Imperial gardens. 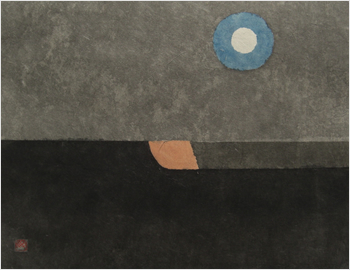 In that sense, they may respond to the same nostalgic impulse that inspired the gardens of Katsura Villa. The gardens of Kyoto’s Imperial Park include three featured in this website (for the other two, see Sento Gosho and Shusui-tei). The current site of the Imperial Palace was once the estate of one Tsuchimikado Higashi, the original palace having been located slightly to the southwest. 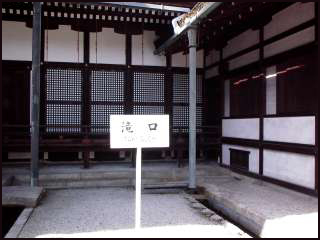 The Kyoto Gosho did not become the permanent residence of the Emperor until the Shoguns Nobunaga and Hideyoshi rebuilt it in the late 16th Century, and the present buildings date only from 1855. It is difficult to guess how many of the garden elements found to the east of the palace complex predate the late Edo Period, but it is clear that whoever designed the more private stream garden must have had in mind the “poetry contest gardens” of the earliest Emperors. Even the pond garden with its islands and Chinese-style arched bridge may have been a conscious attempt at recreating the great water gardens of the Heian nobility. The shrine is located in the North-West, at the Tenmon gate 天門 of the Imperial Palace Gosho. 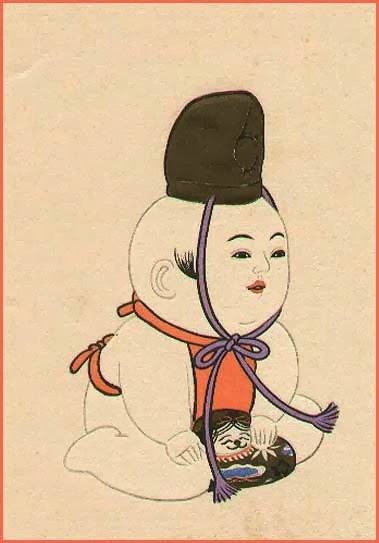 Persimmon "of the imperial palace"
Gosho Ningyo generally represent fat, happy babies in a simplified infantile form. A heavy coat of gofun to achieve the perfectly white skin so prized in Japan seals them. They have minimal painted facial features - just the essential amount of detail ("no more - no less") to capture the essence of the child. Instead of switching to the popular inserted glass eyes, gosho artists maintained the spirit of these dolls by keeping the traditional black inked eye treatment. Kyoto National Museum states that these white, rounded, chubby figures are thought to have been influenced by the naked children Saga dolls. They were initiallly presents from the Imperial Palace to the Daimyo and other vassals. 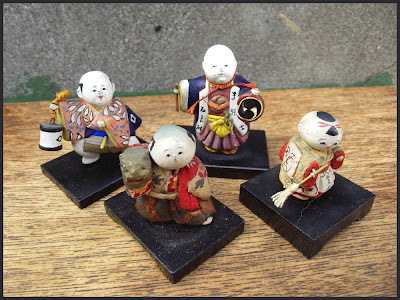 There are many names associated with gosho dolls: "Good luck dolls", shira-kiku "white chrysanthemum", shirajishi-ningyo "white flesh doll", zudai "large head", or Izukura ningyo which refers to a Osaka doll dealer. The term "gosho" can be translated "from the Imperial Palace" since they were originally created by doll makers in Kyoto specifically to be gifts from the Imperial household to their special visitors. The recipients treasured these. The merchant class wanted to emulate this royal gift giving ritual - a status symbol. Thus the practice of giving gosho ningyo as special meaningful gifts spread throughout Japan. 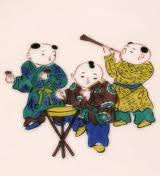 They carry auspicious items, like peaches or turtle and crane for longevity or a treasure ship (takarabune　宝船) for good financial fortunes.
. karako　唐子 Tang-China children (and grown up) patterns . Later they began to imitate (mitate　見立て) famous historical scenes and persons. 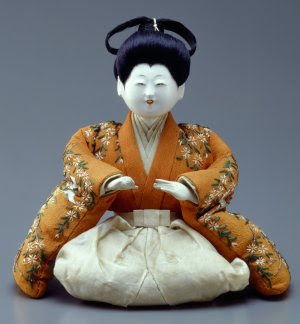 Dolls that could be bent three times (mitsu-ore　三つ折れ) were developed during the late 18th century. They come in various forms, like beautiful ladies in the robes of various historical periods, Kabuki and Noh actors and even as small amulets to protect children from illness. Saga ningyo are considered to be the finest and rarest of the wooden carved dolls. Saga dolls originated during the Edo period in the town of Saga which is close to Kyoto. Without a doubt, Saga dolls were originally made by the same craftsmen who produced shrine deity statues. With just one look you can see similarities to the statues found in shrines. 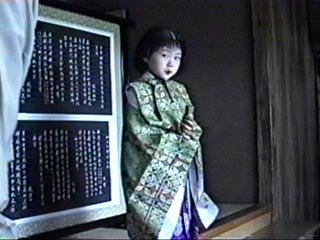 One of the earliest Saga ningyo is kept in a temple as a religious piece. Most early Saga dolls have a religious aspect to them, either as representations of Buddhist deities or as humans whose qualities made them deities after their death. Toward the late Edo Period the dolls became a bit more playful with wobbling heads and tongues that protruded when the dolls are tipped forward. As stated, the workmanship of these dolls is remarkable. The carving of the wood was exquisite and the colors were dark lacquer, elaborately decorated in red and gold colored lacquer. 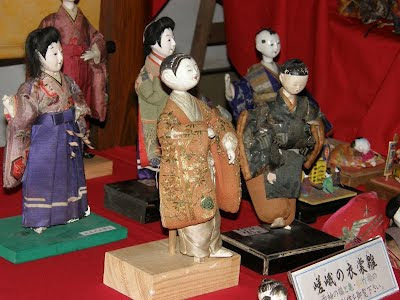 These dolls were so popular in Edo that doll making shops copied the style, calling them Edo Saga ningyo. One of these dolls is represented in the accompanying picture. Edo Saga dolls were usually shown in active poses and required a stand of some sort to support them. Imperial Palace . . . It was named so because it was close to the mikawa-mizu 御溝水 water supply of the imperial palace. They used bonfires in standing baskets (kagaribi 篝火) and torches (taimatsu 松明) . These two hokku are said to be in memory of the famous poet-priest 西行法師　Saigyo Hoshi.
. Matsuo Basho and Saigyo . uewarawa, shootoo 上童（しょうとう） were young maidens serving at the royal palace.
. kitsune　狐　the Fox Deity .
. kokaja dete hana miru hito o togame-keri . kokanja, kokaja 小冠者 young samurai who has just passed the ritual of genpuku 元服, coming of age for a samurai boy.
. haru no yuube taenamu to suru koo o tsugu . The court ladies add more incense . . .
. Kyoto (Hana no Miyako 花の都) .